GIS on the Web – Where to next? It is no new concept that we serve maps and other spatially related data on a web page as opposed to having specific software to view maps. Google was, and in some cases still is the leader in online map data, with its Google Maps platform taking off like wildfire. It is now common to see developers and web designers alike using the Google Maps API in all forms of technology, not only on the web. Access to all forms of spatial data is becoming easier to find and thus manipulate to your desired level. But where is this technology going to next? What’s next for the relationship between the web and GIS? It is estimated that GeoServer has approximately 40% of the open source GIS market. GeoServer is built on GeoTools, an open source Java GIS toolkit, that is highly based around standards. GeoServer conforms to Open Geospatial Consortium (OGC) Web Feature Service (WFS) and Web Coverage Service (WCS) standards, as well as a high performance certified compliant Web Map Service (WMS). 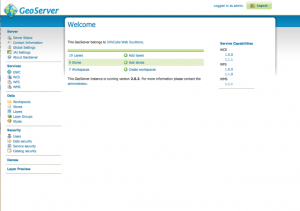 The best part about GeoServer? It integrates with external Mapping API’s including ESRI and Google Maps. GeoServer supports all datatypes, vector and raster and is able to be connected to Spacial Databases such as PostGIS, Shapefile, ArcSDE, DB2 and Oracle. In terms of administration GeoServer has more features than you know what to do with, which is good for getting exactly what you want out of the GIS System. 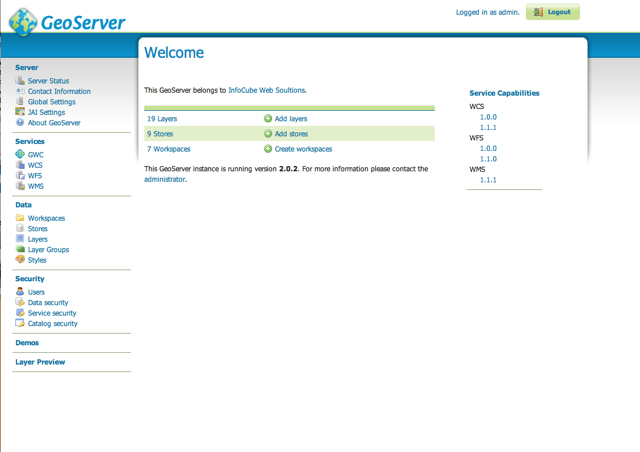 For the Web User who wants an easy to use package with intuitive interface, GeoServer is for you. MapsServer was originally developed in the 1990’s when ESRI were beginning to introduce their command line version of ArcGIS, so it is no stranger to the GIS World. In saying this, it is a much more Web Developers tool than a novice GIS Web user that wants an out of the box solution. MapServer has just as many features as GeoServer they are just harder to find and to get to. MapServer supports the 3 major mapping standards of WCS, WMS, WFS and can even create interactive PDF documents for Commercial use. MapServer integrated with PostGreSQL, a SQL distribution that is Open Source and build with spatial datasets in mind. With these in mind it is down to answering my original question… What’s next for the relationship between the web and GIS? With the obvious progression towards web applications in all forms of technological development, surely we can take these same paradigms into the Web GIS world also. With the recent fruition of HTML5 and CSS3 and porting these technologies into the mobile realm it is not hard to paint the picture of the futures of GIS. Web will hold the geo-spatial data that we have, and mobile devices will be able to access it. The relationship will be more active than its current passive state. Currently we have Maps API’s regardless of their form showing data. The interaction is very limited. The next step is to use such open source technologies named above that enables users to manipulate the geo-spatial data and view what they want to view. It’s data on demand for the people, by the people. You have touched on a topic that is close to my heart and I agree with what you have said. I would also like to add that the GoogleMaps API is not the only API out there. I would encourage all web mapping developers to explore the world of OpenLayers. I switched from GoogleMaps to OpenLayers many years ago and have never regretted it. The key thing for me then (maybe not so much now I’m not sure) was OpenLayers support for OGC WMS/WFS. If we are going to reach a truely open world we need to have many different people publishing spatial data in an open standard format – read OGC. That creates an interoperable spatial data infrastructure that any enterprising web developer can start to build web mashups that access data from all over the planet. The traditional GIS market is finite and really a neiche market anyway. 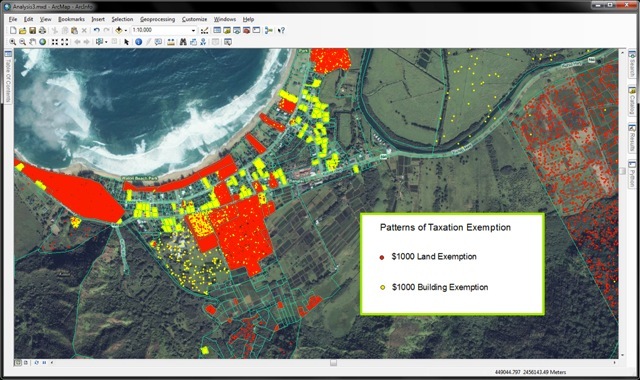 The real opportunities reside with the broader use of spatial data in areas and markets that are not even aware of mapping as a business tool. This market(s) is relatively speaking unlimited in comparison and that is where a lot of these GoogleMaps mashups are coming from. More data more apps. Bring it on!